Since you, our loyal readers, have been so, well, loyal, we’re brining Randy Crouch and Flying Horse to a venue near you. Think of it as our yearly gift, a service we love providing every year since we’ve been in circulation. Spread some holiday cheer, holiday beer and share you 1,000 watt smiles with Randy. 12/20 – Max’s Garage, Muskogee (w/ Jim Blair & the Grease Monkeys) – 21 & Up – 9 p.m.
12/22 – Brangus Feed Lot Club,McAlester – All Ages – 9 p.m.
12/28 – Roxie’s Roost, Tahlequah (w/ Elephant Revival Concept) – 21 & Up – 10 p.m.
12/29 – Bartlesville Convention Center (w/ Dustin Pittsley Band, Jimmie Johnson and Ann Janette) – All Ages – 7 p.m. Established Artist Spotlight - Randy Crouch If one was to go exploring through the deep recesses of the forest surrounding the Oklahoma landmark of Teresita, one might stumble across a very unique and somewhat magical place. It is the home of a sasquatch. The sasquatch's name is Randy. At first, upon approach, one would smell the smooth undertones of a distant woodstove burning in the breeze. Then one might almost trip over a giant percussion section made from varying sizes of hollowed out logs that are difficult to spot under fallen leaves and undergrowth. About this time one might hear music flowing intermittently between the trees. Maybe a guitar or a piano or, if one should be so lucky, a fiddle. Soon after that one would find oneself upon Randy's doorstep, standing before a series of wooden geodesic domes that Randy built amongst the woods. The sasquatch himself would smile and offer up a cold Busch in a can. This is Randyland, the home of Randall P. Crouch and his amazing wife, Liz. Randy the sasquatch lives peacefully and out of the way in those woods. He would make a great hero in a children’s' story, don't you think? "There once was a sasquatch that lived far into the deep, dark woods north of Tahlequah. 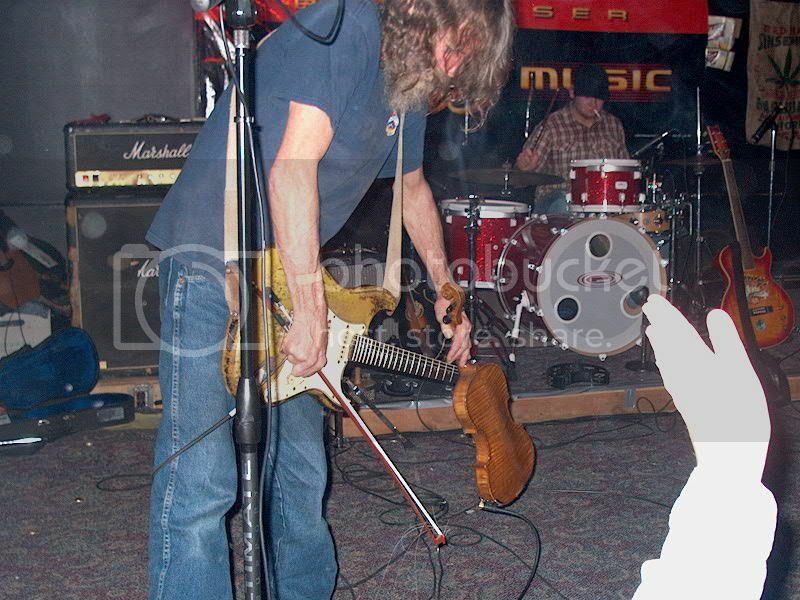 He lived there with his beautiful wife, a Fender Stratocaster, and a Flying Horse..."
Randy Crouch is one of the burliest, craziest, wisest, nicest, and most talented musicians to ever wear a pair of boots. He is a virtuosic multi-instrumentalist that hails from Texas (but went Okie as soon as he could) and now lives in the land he loves so much. He is well-known for his rowdy, rebellious live performances. Crouch has been witnessed by dance-crazed concert-goers playing his Stratocaster with the top side of his fiddle while holding a flaming $50 bill in the other hand, waving it around to add oxygen to fire. Now that's stickin' it to the man! Crouch is so well versed in Country and Bluegrass as he is in Rock, he’s often been called the "Jimi Hendrix of the fiddle." Since the mid 1970s this man has been thrilling audiences with his prowess on the fiddle, guitar, piano, pedal steel and the kitchen sink. His first of many solo releases came in 1978 and have become cherished additions to many music lovers' collections. Crouch has appeared on multitudes of other peoples' recordings including folks like South 40, Jason Boland and the Stragglers, Bob Childers, Tom Skinner and many more. The list of people Randy has collaborated with is astounding. There is nary a musician in this part of the country that doesn't want Randy sitting in on any given night. Currently he is touring with his band, Flying Horse, and holding down the fiddle position for the Red Dirt Rangers, a band of Oklahoma legends themselves. Though he has been around the block more than a few times in his life, Randy never loses his zest for what's still to come. On some summer night a couple of years ago, Randy was sitting next to a young man at Roxie's Roost who was lamenting having turned 30 years old. He turned to Randy and inquired as to whether or not it was all "down hill from here" and if 30 was "the beginning of the end?" Randy turned to the young man and said, "You know what? It all just kind of started for me two weeks ago." Randy has a way with words. His original songwriting is amazing, his lyrics reflecting the land and people that he came from and holds dear in his heart. He is an advocate for nature, friends and family. He is non-violent. He is a peaceful Rocker with no real boundaries to his music. A Randy Crouch show doesn't just skate the edge of what has come before. It stumbles off of it and plummets yelling "Geronimo!" and laughing the whole way down. It is indefinable and unexplainable; sore feet and ankles from dancing being the most convincing evidence that it ever really took place. No, it wasn’t a dream - it wasn’t a spectacular, mind-blowing, life-changing dream. Luckily for all the inhabitants of Currentland, Randy abides their necessity for his Rock/Country/Rock/Bluegrass/Rock/Red Dirt Rock by playing numerous shows in the area year-round. In the month of December, you can catch a few Randy Crouch and Flying Horse/The Current Reader Appreciation Shows at several venues including Riggs and Co. in Langley, Ok., on Dec. 1, Max’s Garage in Muskogee on Dec. 20, Bahrangas in McAlester on Dec. 22, Roxie’s Roost in Tahlequah on Dec. 28 and at the Bartlesville Community Center in Bartlesville, Ok., on the night of Dec. 29. Crouch and band will also be performing a two-night stand Dec. 13-14, at The Green Door in Fayetteville, Ar. One to stay plenty busy, Randy will also be accompanying the Red Dirt Rangers for a myriad of holiday-season shows throughout Green Country. Websites that will point you in the right direction include www.randycrouch.net, www.myspace.com/randycrouch, www.reddirtrangers.com, and www.myspace.com/reddirtrangers. Randy Crouch is a visionary, a revolutionary, a mystic, an icon, and a legend. Years from now the fable will continue as told to the young by the elders. It will be one of their favorite stories. They will love to hear about how "the sasquatch Randy would play his magical guitar and the golden fiddle he won in a contest with the Devil well into the night. The animals of the forest, neighbors from all around, and the ghosts of Jimi Hendrix and Hank Williams would all gather to listen and drink sweet honey mead made in a still Randy had fashioned from the trunk of an old mulberry tree. And they would dance…"